As someone who comes from a technologically literate generation, sometimes it is difficult for me to imagine what it might be like to not know how to use a cell phone. These thoughts are then tempered when I remember how difficult it is for me to pick up an Android when I am so used to the touch of an iPhone. Even the small change in the smart phone interface could pose a challenge to an adept smart phone user. Which is why Medic Mobile’s training sessions on its health platforms is so critical for Community Health Workers (CHW’s). To deploy mobile application and cell phone technologies to CHW’s, Medic Mobile in Kenya, where I am interning, works alongside other organizations. These training sessions are held in central community buildings like schools, churches, or health centers. Medic teammates along with highly trained Community Health Assistants (CHA’s) hold classroom sessions in which CHW’s learn how to use the phones and navigate the application. There are two main ways in which Medic Mobile’s technology platform serves these communities. The first is through a standard SMS model. This platform is meant for health workers who use non-smartphones and it functions through SMS messaging. The health worker texts a series of numbers and letters that the software on the other end decodes and interprets. For example, a health worker might text a ‘P’ to register a pregnancy. This ‘P’ is then followed by a series of numbers that identifies the woman who is pregnant. The system then enters that information into the database and sends a confirmation text back to the health worker. The second platform is the mobile application. For CHW’s that have access to smartphones, this is an application that they download on their phone and they enter the same kind of information into the database as health workers who use the standard SMS model. The difference is that these CHW’s are interacting with the application interface instead of text messages. The application also gives health workers additional, more complex diagnostic tools. It prompts family planning questions, and it can offer information on assessing the health of patients. Both of these models serve to digitize health information. Tracking pregnancies, child development, immunizations, and multitudes of other health outcomes prevents people from being lost in the shuffle. The technology also empowers health workers within the communities. The data that Medic has collected shows that by registering pregnancies and referring them for health clinic visits, mothers are more likely to go to the clinic to receive prenatal and antenatal care. They are more likely to deliver their babies in a health facility, and they are more likely to access health services for their children after they are born. Maternal mortality is, in most cases, preventable. 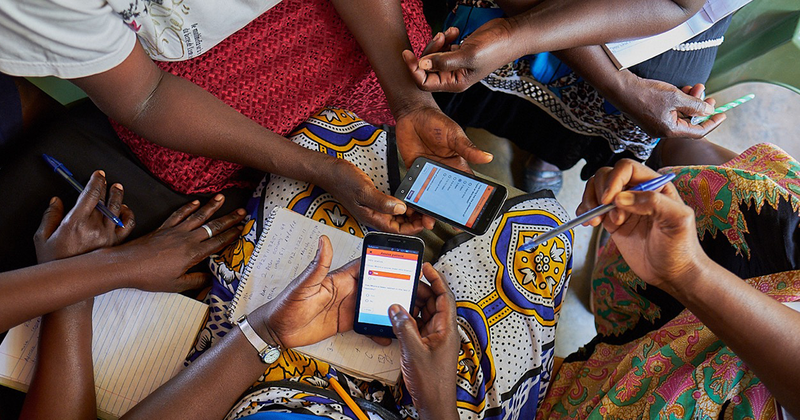 Using technology to track health data gives people in rural communities the tools to reduce maternal and child mortality rates and improve overall health outcomes. I was given the opportunity to sit in on multiple training sessions, both for the mobile application and the standard SMS deployment. The training sessions usually start in the morning and last all day. At nine in the morning, a Medic team member was setting up posters at the front of the health facility, and health educators from the community and other organizations were prepping materials for the training session. CHW’s filed into the room slowly and sat in the rows of plastic chairs. In total, there were about 50 people in this training session. Men, women, old and young – these are the people that provide health care to the community. The session began with a prayer and a song. Following this, there were people teaching at the front of the classroom and asking for participation, and there were breakout sessions where CHW’s worked in groups of four or five to complete small exercises on the phones. It was simple yet extensive, and it was apparent that the health workers were making progress throughout the day. Training people to use cell phones was more complex than I thought. Simple roadblocks like: how to capitalize a letter, using an ‘O’ instead of the number zero, or in some cases holding the phone upside down, were not challenges that I would have anticipated being a problem. This is why it is so important to interact directly with community members. The difference between an ‘O’ and a zero could mean people could go unaccounted for or information could be lost. Developing these tools from the ground up allows the Medic design team to account for minor challenges that end up making a big difference. The training sessions are, simply put, to give community health workers better tools to better serve their communities. But every training session gives the Medic team an opportunity to further develop their workflows to better serve individual communities. This process of human-centered design is continuous, and it is supported by so many people from around the world who work to make sure that people have the best access to health care possible. From the software developers, to the researchers, to the people who act like glue and hold all the loose ends of the company together, everyone has a unique and important job that culminates in a product that has seen a huge impact on the lives of so many individuals.